we believe in offering only the best utility bodies possible. In order to be superior, we’ve strived to use only the most rugged materials and the most well thought out designs, crafted with the highest level of workmanship. Sometimes a generic bed just doesn’t cut it. Maybe you need a bed that is built to outlast the lighter gauge beds you’ve bought in the past, or survive the rough terrains you operate on. Maybe you need options; your specialized line of work requires all of your equipment to have an organized place, and only a custom bed will do the job for you. We can help you organize your compartments, offer you the specialized equipment you need for your job, and guide you with the experience that comes from a company that’s been family owned and operated since 1958. This website presents just a sample of our capabilities, options, and accessories. When you’ve had an opportunity to think about the body you want, call our knowledgeable sales team, or visit us for an in-person consultation. We’ll provide you with an itemized quote detailing your needs. We can turn those specs over to our drafting department to have an AutoCAD drawing created, finalizing crucial dimensions and equipment layouts for your review. Only after we have your approval will we begin the process of braking, shearing, welding and hand assembling your unique bed. That spirit of quality manufacturing, of building FOR the customer, is what has driven Douglass Truck Bodies for more than 50 years. Sometimes you need a bed that’s built to fit YOUR needs. Welcome to Douglass Truck Bodies. We look forward to working with you. Douglass Truck Bodies Incorporated has been a fixture in the Service Body and Work Truck Community since 1958, however the Douglass story truly begins in 1922. Relocating to California with merely $50 in his pocket, Clinton Douglass Sr. proved himself to be a true entrepreneur. His business ventures included property investment, partnership in oil leases, building canvas tops for cars, as well as selling used cars and trucks. His son, Clinton Douglass Jr., returned from World War II where he was serving as a pilot in Europe and took over the family business selling used cars and trucks in 1946. In the early 1950\'s he started buying used cab & chassis from the telephone company, which required him to search out used pickup beds that he could install on the trucks before selling them. However, he soon found beds becoming scarce. After a few months he remembered, "I had bought all the used beds I could find. At this point I wanted to try my hand at building a pickup truck body. Wanting something different than an average pickup bed, we decided to integrate side-locking compartments while retaining the normal pickup bed height." Thus the creation of Douglass Silhouette Service Body. In 1958, Clinton Douglass Jr. started C. C. Douglass Manufacturing to compliment C. C. Douglass Used Cars. That same year he earned his first national fleet contract with Gulf Oil. 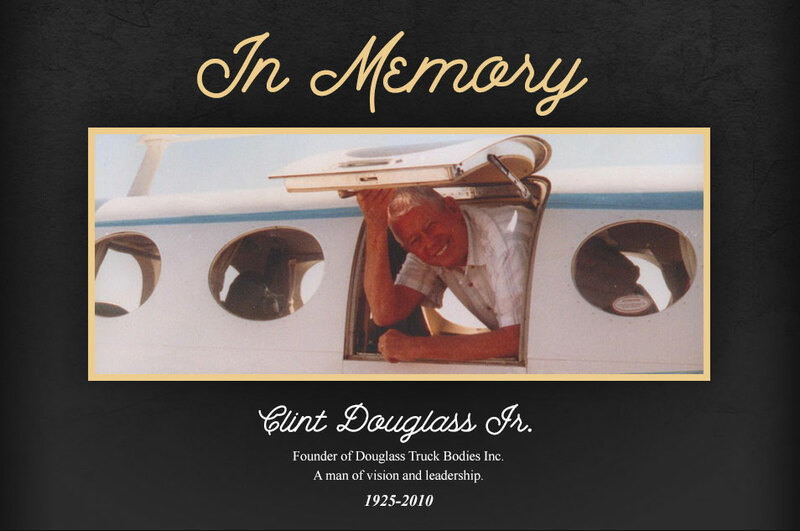 It wasn\'t long after adding the manufacturing facet of the business that he decided to shift focus from used cars to C. C. Douglass Manufacturing (later Douglass Truck Bodies). By 1962 patents had been acquired for his product not only in the United States but also in Canada, Mexico, and Japan. Before long Low Silhouette Service Bodies by Douglass were being exhibited in traveling trade shows, stretching as far as the Tokyo Dealership Show. As business grew, so did the Douglass Manufacturing facilities. The shop expanded to include a new fabrication area, complete with a state-of-the-art Press Brake and Shear amongst other equipment. Clinton Douglass Jr. had his eye on expansion. In 1969 he found himself breaking ground on a second branch in Santa Fe Springs, CA. The Santa Fe Springs Branch opened in 1971 under the management of Vincent Basta. Over time, Douglass Truck Bodies opened branches in San Diego, Stockton, and Sacramento as well. In the 70’s his daughter Debbie, and his son Darrell, came to work for the company. Darrell played an integral role both in sales, and in overseeing the production end of the business. Debbie was promoted to vice president, then subsequently president of the company after years of managing the office. This marked the third generation to run the family business. In early 1992, Debbie stepped down from her presidential responsibilities to focus on real estate. Today she still serves as vice president of Douglass Truck Bodies. Clinton Douglass Jr.’s grandson Rick Douglass relocated to Bakersfield in the summer of 1992 from his home in Cheyenne, Wyoming to work in the family business. Rick started in sales, in addition to handling parts sales, filing, setting up exhibits at various trade shows, running trucks for pictures and to be weighed. With the mentoring of his grandfather Rick had worked his way up within the family business. He was promoted to president of the company in July of 1993. Rick marked the forth generation of the Douglass Family to run the business, and the third generation specializing in truck bodies. After celebrating 55 years dedicated to serving the Work Truck Industry, Douglass Truck Bodies, Inc. may look very different than when it was a small canvas top business in the 1920’s, but our core values have never changed. We carry on the attitude of continued improvement and innovation in everything we do. 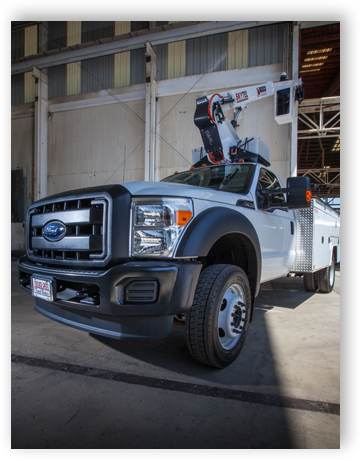 The Douglass Truck Body itself has modernized, adopting new industry technologies as the needs of our customers became increasingly unique. Relationships remain our priority, from our valued and dedicated customers, to our vendors, and our great employees. Douglass Truck Bodies constantly strives to be the best in all sectors of the business, from design and manufacturing, to customer service and quality.